This article is about the Beatles' song. For other songs of this name, see I'll Be Back (disambiguation). "I'll Be Back" is a song written by John Lennon (credited to Lennon–McCartney), and recorded by the English rock band the Beatles for the soundtrack album to their film A Hard Day's Night (1964) but not used in the film. This song was not released in North America until Beatles '65 five months later. According to musicologist Ian MacDonald, Lennon created the song based on the chords of Del Shannon's "Runaway" which had been a UK hit in April 1961. Author Bill Harry also wrote: "He just reworked the chords of the Shannon number and came up with a completely different song". With its poignant lyric and flamenco style acoustic guitars "I'll Be Back" possesses a tragic air and is somewhat eccentric in structure. Unusually for a pop song it oscillates between major and minor keys; appears to have two different bridges and lacks a chorus. The fade-out ending also arrives unexpectedly, being a half stanza premature. Producer George Martin preferred to open and close Beatles albums using dominant material stating: "Another principle of mine when assembling an album was always to go out on a side strongly, placing the weaker material towards the end but then going out with a bang". Ian MacDonald points out however: "Fading away in tonal ambiguity at the end of A Hard Day’s Night, it was a surprisingly downbeat farewell and a token of coming maturity". 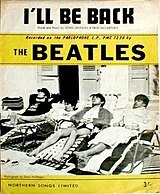 Music journalist Robert Sandall wrote in Mojo Magazine: "'I'll Be Back' was the early Beatles at their most prophetic. This grasp of how to colour arrangements in darker or more muted tones foreshadowed an inner journey they eventually undertook in three albums' time, on Rubber Soul". The Beatles recorded "I'll Be Back" in 16 takes on 1 June 1964. The first nine were of the rhythm track, and the last seven were overdubs of the lead and harmony vocals, and an acoustic guitar overdub. 4 time used in the final take. Cliff Richard included his cover of the song on his 1967 album Don't Stop Me Now!. Reggae band The Paragons released a version titled "I Want to Go Back" on their 1967 album On the Beach. Wes Montgomery included his cover of the song on his 1968 album "Road Song". Herb Alpert & the Tijuana Brass included it on the album The Brass Are Comin' (1969). "I'll Be Back" was one of the eight Beatles songs covered by Stars on 45 on their medley "Stars on 45", which went to No.1 on the US Billboard Hot 100 in June 1981. In 1987, Gene Simmons and Paul Stanley of KISS perform an a cappella rendition of "I'll Be Back" in the home video Exposed. UB40 released a reggae version on their 2008 album TwentyFourSeven. Elliott Smith recorded a version of the song during sessions for From a Basement on the Hill. Shawn Colvin recorded the song for Polaroids: A Greatest Hits Collection in 2004. Johnny Rivers covered it for his 2004 album Reinvention Highway. Golden Earring recorded the song for their 1995 album Love Sweat. The MonaLisa Twins have recorded "I'll Be Back" as a music video, available on their website and on YouTube. The Mexican band El Amor made a Spanish version with the title "Si Me Dejaras" in their 1971 debut. ^ a b Harry 2000, pp. 542–543. ^ a b c d MacDonald 2005, p. 119. ^ Mojo 2002, p. 113. ^ Lewisohn, Mark (1988). The Complete Beatles Recording Sessions. New York, New York: Harmony Books. p. 44. ISBN 0-517-57066-1. ^ Everett, Walter (2001). The Beatles as Musicians: The Quarry Men Through Rubber Soul. New York, NY: Oxford University Press. p. 242. ISBN 0-19-514105-9. ^ "Cliff Richard - Don't Stop Me Now!". Discogs. Retrieved 7 September 2017. ^ "Road Song - Wes Montgomery". AllMusic. Retrieved 7 September 2017. ^ "Herb Alpert & The Tijuana Brass – The Brass Are Comin'". Discogs. Retrieved 7 September 2017. ^ "UB40 – TwentyFourSeven". Discogs. Retrieved 7 September 2017. ^ "New Music: Elliott Smith – 'I'll Be Back' (Beatles Cover)". Rawkblog. 14 February 2009. Retrieved 21 August 2011. ^ "Polaroids: A Greatest Hits Collection - Shawn Colvin". AllMusic. Retrieved 7 September 2017. ^ "Reinvention Highway - Johnny Rivers". AllMusic. Retrieved 7 September 2017. ^ "Love Sweat - Golden Earring". AllMusic. Retrieved 7 September 2017. ^ "I'll Be Back". Retrieved 16 February 2018. "I'll Be Back". The Beatles Bible. 2008. Retrieved 22 October 2008. "...exactly.". CD Baby. Retrieved 14 February 2010. Martin, George. Summer of Love. MoJo Special Limited Edition: 1000 days of Beatlemania. EMAP Metro Limited. 2002. Alan W. Pollack's Notes on "I'll Be Back"
This page was last edited on 21 March 2019, at 04:32 (UTC).